It’s a beautiful sight when the sun goes down, the moon comes out, and the stars start to cover the sky. To the amateur stargazer, one might not understand why the Namibian sky is one of the most beautiful in the world. 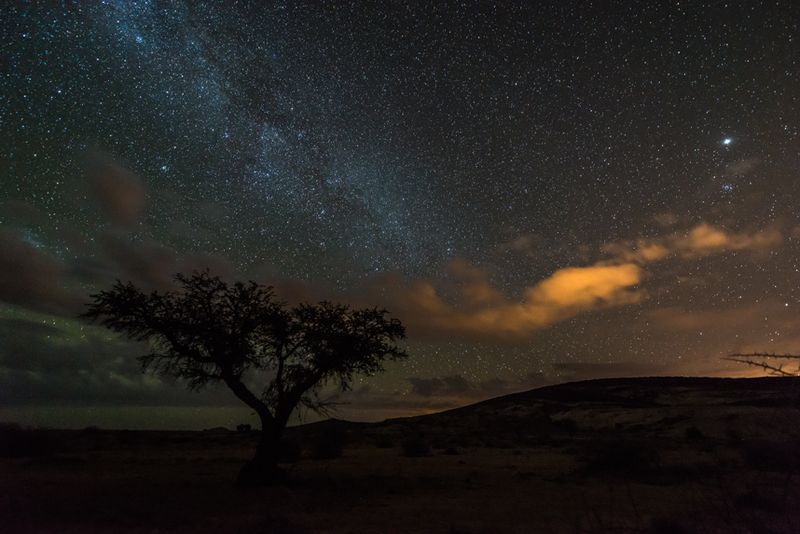 Due to the low population density, the very low air pollution, and the virtually non-existing light pollution – Namibia offers ideal conditions to explore the southern night sky. 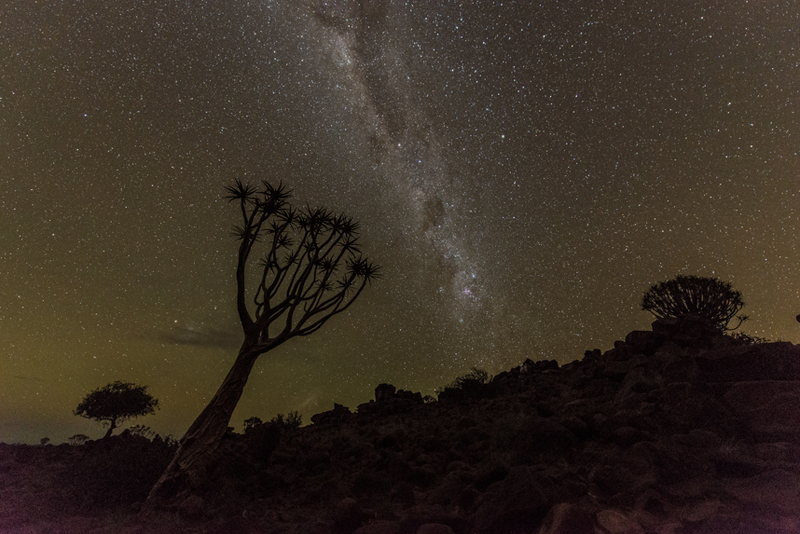 The dry, winter months are the best time of year to experience astonishing stargazing in Namibia. Astronomy is the oldest of the natural sciences, dating back to antiquity. Ancient civilizations believed their gods lived in the skies, and so early astronomy was often a mix of detailed observations of the celestial heavens and religion. Not only did astronomy serve as a map of life practice, but it also helped predict the cycle of seasons for farming, measuring time, and as a compass. There is evidence from 32,500+ BCE suggesting that during the Upper Paleolithic period, people had been tracking the moon’s phases and might similarly have memorialized star patterns. A famous example includes a small mammoth tusk that suggests a depiction of the constellation Orion. For our friends from the northern hemisphere, the most recognizable constellations in the southern hemisphere are The Southern Cross and the two pointers, Alpha and Beta Centauri, The Jewel Box, Coal Sack, Omega Centauri, 47 Tucanae, The Tarantula Nebula, Megellanic Clouds, and Eta Carinae. The Southern Cross is similar to the Big Dipper in the north. It is clustered around the south celestial pole and never sets. Becoming a stargazer is pretty simple. If you can read a road map, you can read the night sky. For a good place to start, you can head over to this website – One-Minute Astronomer. They provide a free guide to the night sky, and basic astronomy. In 2012 Namibia’s NamibRand Nature Reserve became Africa’s first official International Dark Sky Reserve – which is suited for that world-class stargazing. Here at Kupferquelle, you can enjoy the beautiful night sky form the comfort of your chalet. If you’re inclined to do so, take a stroll outside with your handy binoculars to really immerse yourself in the majestic blanket Mother Nature provides for you. If you’re interested in other aspects of astronomy, head out to the site of the Hoba Meteorite – located close to Grootfontein, 45 minutes northwest of Tsumeb. By definition, meteorite is a meteor that survives passage through the earth’s atmosphere such that part of it strikes the ground. More than 90% of meteorites are of rock, while the remainder consist wholly or partly of iron and nickel. The meteorite was discovered in 1920. It’s estimated that it is between 190 million an 410 million years old, weighing in at 60 tonnes (originally 66). Hoba is composed of 82% iron and 16% nickel, with traces of cobalt and other metals. After a beautiful day of exploring, return to Kupferquelle, grab those binoculars, and enjoy the night sky for some of the best stargazing in the world!